The spacesuits worn by Apollo astronauts such as Buzz Aldrin were designed to optimize life support, not mobility. Newly designed suits may allow future moonwalkers to move faster on the lunar surface. Astronauts may be able to walk on the moon faster than previously thought, a new study reports. The findings could help scientists design better spacesuits that could aid astronauts' exploration of the moon, Mars or asteroids, the researchers added. Volunteers walking and running during parabolic flights that induce gravity levels similar to those experienced on the moon. "The spacesuits worn by the Apollo astronauts weren't designed to optimize mobility — they were designed to optimize life support," said lead study author John De Witt, a senior biomechanist at NASA's Johnson Space Center in Houston. "The suit designers were not concerned about making the legs move, but were more concerned with things such as oxygen, water and cooling," De Witt told Space.com. "As a result, the Apollo astronauts could not move their legs very much in their spacesuits, and they found it easier to hop all over the place instead of walking." Volunteers walk and run during moon gravity mobility tests on a parabolic flight as part of a new study. To design modern spacesuits that permit more freedom of motion, De Witt and his colleagues investigated how people move in low gravity, including the speed at which humans break from a walk into a run. 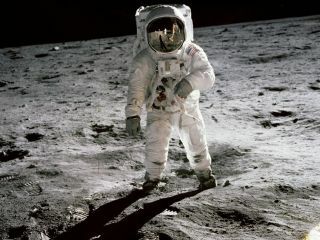 To their surprise, they discovered that astronauts should remain walking on the moon at higher speeds than thought. To explore the effects of the moon's gravity, which is about one-sixth that of Earth, the researchers conducted experiments on airplanes nicknamed "Vomit Comets." These planes fly up and down in parabolic arcs to temporarily induce reduced levels of gravity astronauts would feel away from Earth. During each swooping arc, which lasted about 65 seconds, the scientists had only about 20 seconds during which they could test each volunteer's walking and running styles on a treadmill at one-sixth Earth gravity. The investigators recruited three astronauts and five other volunteers who could tolerate such roller-coaster flights. Theoretical calculations predicted the walk-to-run transition would occur at about 1.8 mph (2.9 km/h) in lunar gravity. However, the researchers discovered the average speed for this shift in their experiments was about 3.1 mph (5 km/h). These new findings support data from previous studies that simulated lunar gravity by supporting five-sixths of people's weight in an overhead harness as they walked and ran. De Witt suggests that the forces generated by the swinging arms and legs could account for this shift in the transition between walking and running. "The forces generated by swinging limbs end up pushing bodies downward, keeping people from leaving the ground and transitioning into a run," he said. The new data will help inform spacesuit design, De Witt said. "We want to make better suits for exploration purposes, for astronauts landing on other bodies in the future, whether that's the moon or Mars or an asteroid," De Witt said. The scientists detailed their findings online Sept. 17 in the Journal of Experimental Biology.